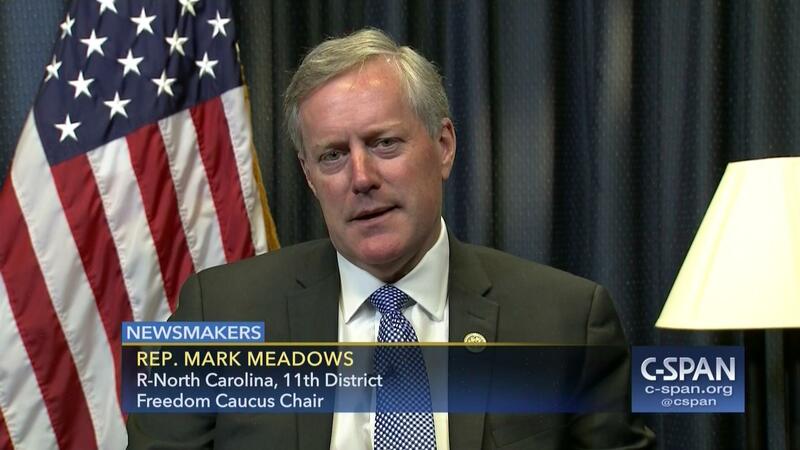 Mark Meadows exemplifies everything that’s wrong with America right now. I wasn’t going to go to the Mark Meadows town hall tonight. There’s nothing he can say to convince me he’s right, and he won’t let me speak to him. At the last town hall I went to, questions had to be written out, and we were told they would be asked in the order they were submitted. I was the second person through the door and I submitted the second question. But mine was not among the eight questions asked. I approached Meadows afterward to ask why that had happened, but he took one look at me when I stuck out my hand to introduce myself, said, “Oh, I know who you are,” and turned his back to me. This man is supposed to be representing the people of Western North Carolina, but he refuses to speak to anyone who might disagree with his cruel and inhumane policies. The first attempt to pass Trumpcare in the House of Representatives wasn’t severe enough for Meadows and his “Freedom Caucus.” It didn’t take enough away from people. It still saved a few lives, after all. It had to be made more draconian before he and his sleazy band of thugs would vote for it. I have no use for this man, but I have decided I need to show up with my son’s picture and pray that perhaps I can move him toward compassion. At least I can be there to show that not all the voters in this district are anti-life. This fight takes its toll. I am stressed and emotional from the fight against Trumpcare. I have spent hours and hours writing to Meadows and my senators (Burr and Tillis), only to have them ignore me or send me form letters filled with lies about the Affordable Care Act. Now I have fellow Democrats accusing me of being a “purist” and suggesting I should leave the party because I don’t want to vote for anyone who doesn’t support universal access to quality health care. Let your kid die and then tell me it isn’t imperative that we fix this now. I’ve had little rest lately, as the radicals on the political right try to take away what little progress we have made in access to care. I was arrested in Raleigh in May because I was trying to talk to the NC Senate leader. I was arrested in Washington in July for trying to disrupt a vote to take away health care from up to 33 million people. I’m putting my body on the line and being vilified as a “purist” for my belief that we need access to care for every human being and speaking the truth that we need candidates who will work for us on this. I want a living wage for minimum wage. I want to see it set at $18 an hour and tied to inflation so people don’t have to work three jobs to pay their bills. If you’re making $7.25 an hour, you need that money NOW, not in five years. Only people with unacknowledged privilege think it can wait. The establishment Democrats are exactly what mainstream Republicans were before it was taken over by right-wing radicals. I had differences with them, but could at least respect them. Since 1980, the radicals have managed to drag the entire conversation so far to the right that what once were mainstream Democratic ideals are now considered radical. A living wage as minimum wage? Socialist! Health care for everyone? Communist! If you think I’m wrong, just read the 1976 Democratic Platform: http://www.presidency.ucsb.edu/ws/?pid=29606. I’ve been told I’m too divisive and I should leave the Democratic Party and go Green, which I would do if there was a chance in hell they could win against all the big money now flooding the Dems’ corporatist candidates. So as far as being “purist” and “elitist” goes, screw that. I’m the one staying with the party and trying to make a difference. I voted for Hillary Clinton even though she said she wouldn’t work on single-payer and she wasn’t for a big increase in the minimum wage all at once. Hoe does that make me a “purist” who should be purged from the party? So, if you’re in agreement with Mark Meadows and think we don’t need universal access to care or a living wage for people who work 40 or more hours a week, then join his party because you aren’t a Democrat. Democrats make room for disagreement. Democrats are able to talk things out and compromise. If you want people who will slavishly follow the party line, join the party of Mark Meadows. They love sheep.